It's never too early to start planning for next year's Thanksgiving, especially when you plan on celebrating in classic New York style. Our landmark locations and genuine hospitality provide the ideal setting for our chefs' holiday menus, and your special Thanksgiving meal. 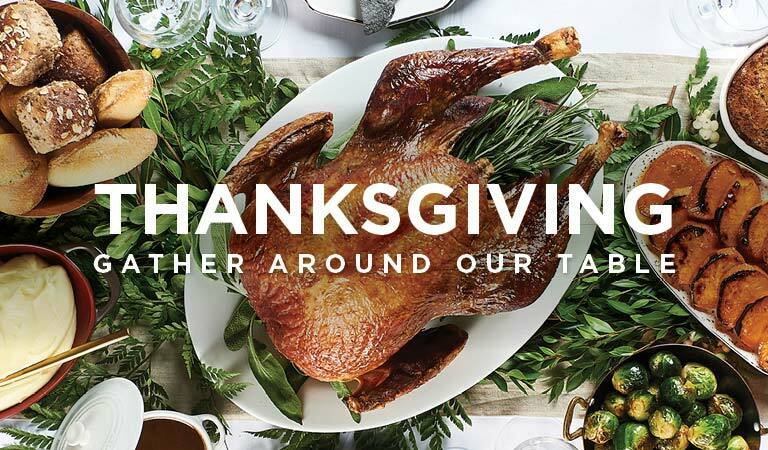 All of our restaurants listed below will be serving a special Thanksgiving menu in 2019. You can email us to be the first to know when reservations open up, or just check back here for more information and menus as they become available. Our stylish French brasserie has a luxurious and warm ambiance, complete with original art from Leger and Matisse, providing the perfect backdrop for Chef Deletrain’s masterful cuisine. Experience Chef Gallante’s Tuscan roasted turkey, autumn pastas and festive sides at our authentic Italian restaurant at Lincoln Center. Our beautiful modern Italian restaurant at Macy’s in Herald Square is a coveted culinary destination in its own right, and the perfect treat for all you early Black Friday shoppers. New York City’s destination for exceptional seafood, The Sea Grill’s Chef Bennett has a very special Thanksgiving menu, complemented by breathtaking views of The Rink at Rockefeller Center. Celebrate Thanksgiving in our welcoming dining room in the heart of New York, just steps from the world’s most famous ice-skating rink, the Rockefeller Center Christmas Tree and Radio City Music Hall! Take in the spectacular rink-side views of Rockefeller Center’s ice rink while enjoying our extraordinary Thanksgiving menu with traditional dishes, seasonal specialties and housemade desserts.